The 12 Robison-Anton embroidery thread colors included in this package are a great base set to start with, providing you with a broad range of basic colors. 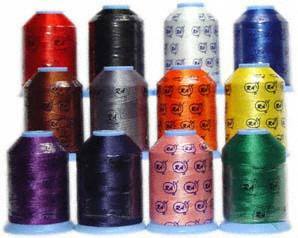 Each 'mini-king' spool contains 1,100 yards of quality, two-ply Polyester thead that is strong and bleach resistant. This set would make a wonderful gift for a new home embroiderer. Shipped FREE in the USA! Please note: We have attempted to match the colors of the threads as closely as possible. However, due to monitor differences and other limitations, the actual color of the thread may be slightly different than displayed. For an exact reference, we recommend that you order your own color card.